Today was a snow day here in Connecticut and most of the northeast. The phone rang at 6:00 am with an alert letting me know that the high school would be closed. My son was thrilled! Ever since his friends in Dallas got two snow days last week, he has been praying for a snow day. He got his wish, even though I don’t think the storm came in quite as big as expected. As the temperatures have started to plummet (and it is getting cold! ), I am realizing that I am not a winter girl. Yes, I grew up in Utah and lived on the ski hill, but as I have gotten older I just prefer the warmth of sunshine. I have lived in a variety of climates – Detroit, Arizona, London, Laguna Beach, CA! – so I definitely think I have learned what I like. I love being outside and sometimes when the winter comes on, I just stare out the window and dread going out in that bitter cold air. Ugh! But, time to buck up! Like it or not, winter is here and I need to settle in. I will admit, that there are very few things prettier than a new fallen snow … and it certainly is beginning to feel a lot like Christmas! 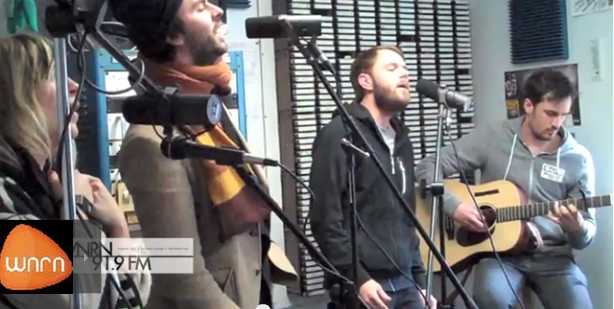 The song today is from an Indie-Folk band called The Head And The Heart. They are amazing! I love their harmonies and the unique sound of their music combined with incredible lyrics. I think Charity Rose has one of the most unique voices out there and, when combined with Josiah Johnson and Jonathan Russell, a remarkable sound is created. “Winter Song” is from their first, self-titled album. I chose this song because it is just beautiful and seemed perfect for the day, but there are so many good songs to choose from by them and so you may see another Song of the Day from them in the future. The band formed in the summer of 2009 after meeting during several open mic performances at a pub in Seattle, and they formally released their first album in 2011. They just released their sophomore album, Let’s Be Still, in October. They have a very loyal fan base and I think they will attract additional fans as more and more people hear their music. Enjoy!